Just a heads up, on September 22nd Carvel will be having customer appreciation day. 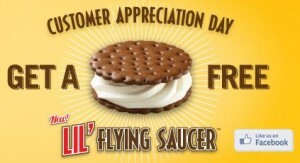 They’ll be giving out free lil’ flying saucers, no purchase neccessary. I’ll remind you guys as the day gets closer. This sounds really good!! I am a chocolate junkie!